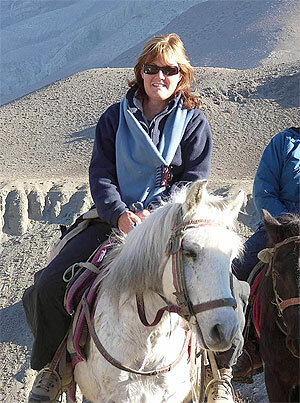 Last Trek Report – October/ November 06 - Trekking in Nepal with Teresa, Slow Trekking for peoples of all ages. Well, much as I love coming home to Australia, it was a real wrench to leave Nepal this time. Our season was better than ever. Lovely customers are always an asset but this season really took the cake. On the Everest Trek I knew all of the participants before we left home. Isabel, Liz, Ian and Frank are all mates. Don has been trekking with me previously in the Anapurnas. Rhonda has been 'threatening to come' for a while so I felt I knew her already. Bruce is Isabel's brother and last, youngest, and dearest of all was my niece Scarlett, barely 20 and called Maya (pure love) by the Porters. The Anapurna participants were ALL FEMALE! This was a 'first' for me so I wasn't sure what to expect. I should have known. From the off there were no pretences. I'm afraid with no male members (so to speak) we soon realized there was no need to 'keep ourselves nice' and, being Australians, we just let ourselves go. Bad language, jokes in extremely poor taste and a lot of very un-subtle joshing got us through the tougher times in fits of laughter. 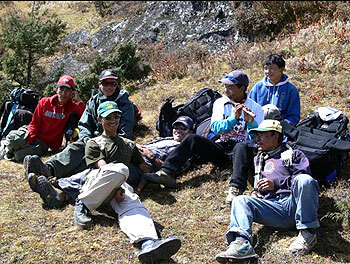 Four of the seven on the Anapurna Trek knew each other already and hailed from around Warrigul/Neerim area. Jan, the vicar of Neerim South, and cast in the Dawn French mould, and her buddies, the two Wendies and Irene (who could have retired 20 years ago but she's a farmer). We had a couple of 'gringos' too. Barbara from Sydney and Mary from somewhere nice further up the coast. We had a token 'younger person' in the form of Debbie from Geelong (forty-something). Flights were a bit hard to come by since Nepal's return to form in the popularity stakes, so several people flew in early and enjoyed an extra day in Kathmandu before I arrived. Don came a day late as his daughter got married the day he left Australia and he thought he had better be there. Maya and I slept -in on the morning of our flight to Lukla (Hey, nobody woke us up). Rushing through security/check in/departure tax/etc, with sleep in our eyes, we were on the tarmac before we had time to drink our tea. It looked hazy in the dawn light but as the plane gained altitude the most beautiful sight was laid out to the north and east. Big, clear, snowy peaks. Yep, this is what we were here for. After the usual terrifying landing, our lodge at Lukla soon had the coffee brewing while Dorje, our guide, rounded up the requisite number of porters. So good to catch up with some old familiar faces (Kancha, Bir, Dorje, Lahar and Niru) and meet a few new ones too (Basanta, Teku, Lekh, Ramesh). It's not a hard walk to Phakding (pronunciation guaranteed to raise a laugh) but as it is our first day we took plenty of tea breaks. Great to be up in the fresh, cool air above 2500 metres and cameras were soon whirring and clicking (or whatever it is that digital cameras do these days). Ian started what we all hope will be a documentary classic. We were in a new lodge, as our regular one was full up, but as we arrived early some of the customers set off to visit the nearby Gompa (Buddhist temple) across the valley. Well, it looked nearby when they set off. Day two of this trek is very easy indeed so we had bags of time to explore the pretty little village of Monjo in the afternoon. Kids were rehearsing folk singing and dancing at the local school so we had an impromptu concert. Full lodge that night and a chance to meet other bideshi (foreigners) over dinner. Next day is a challenge. No doubt about it. It took some of us a lot longer than others, but we all made it to Namche Bazaar by mid-afternoon and wandered off in the fog to see the Tibetan traders in their encampments below the village. Day four is our 'acclimatization' day. We used it to take a leisurely stroll out to Thamo. The peaks were not clear but a whole new range of plants to check out and a record number of yaks travelling from Tibet made the trip memorable. On our fifth day we only popped around the corner for a few hours to Kangzuma. But what a corner. Suddenly you can see all the way up the valley to Everest itself. It kept popping out of the clouds momentarily. Because this trail is fairly easy you can really enjoy the views. Less yak traffic here too. The Ama Dablam lodge was full and the yak-dung fire was extremely cosy. Day six was another tough one. It's a long steady climb up to Thangboche. Steep at first in the deep shaded woods and then a bit less so across the spectacular ridge. Just when you think you can't take another step, the Monastery looms large as you come through the gateway to the village. A visit to this gompa for monks chanting prayers and then the bakery for lunch makes the climb worthwhile. Our cosy little lodge the Everest Laligurans (rhododendron) is down in the valley at Devouche and the views in the setting sun from the back paddock were mouth-watering. Day seven is rather long and not so easy. Ascending at altitude is always tough. As we break through the 4,000 metre barrier after lunch we really felt it. Frank was about to peg out with only forty minutes to go but discovered the 'magic bullet' so beloved of trekkers everywhere. Cup of tea and a Mars Bar. It did the trick. Our lodge at Dingboche (4350 metres) is a good one. Good cooking and warm (well, not draughty) rooms. This is good because we usually stay here two nights. On our second day we set off for Chuking (most of us anyway). Nice to have no packing to do. By the time the halfway teashop appeared on the horizon of an old terminal moraine, Isabel, myself and Rhonda decided that enough was enough. The sight of the Lhotse Ridge, Island Peak, Ama Dablam and Amphu, with the glaciers descending from them was so spectacular from our chairs at the teashop we just couldn't imagine anything better. The rest of the crew made it up to Chukung for lunch and assured us that the view was 'even better' up there. Well, they would say that wouldn't they! 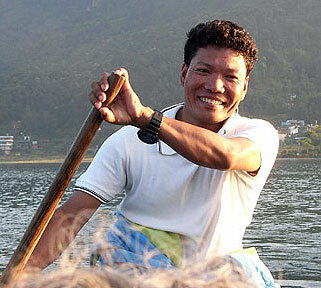 Bruce, perhaps a little fitter and keener than the rest of us, stayed overnight at Chukung with his guide Niru. Early next morning they set off to conquer Chukung Ri. The view from here is said to rival Kala Pattar. He didn't seem to find it too much trouble (see previous comment re: fit and keen). Our descent down to Phunki Tenga was spectacularly fast. The oxygen levels down here are invigorating after a spell at altitude. Next day, re-united with Bruce and Niru, we took a long, long lunch overlooking the valley of giant peaks and then trekked uphill for half an hour to the old village of Kumjung. This village boasts the first Edmund Hilary School and nearby Kunde has the first clinic. After a visit to the local gompa to see the 'yeti skull' in the morning (which Scarlett and I missed due to my amazing navigational skills), we set off on a little-used trail to connect with the Thamo track back to Namche Bazaar. We took a rest in a little hollow in the hilltop with the boys playing flute and singing folk songs, everyone was relaxed and happy because they'd 'made it'. We didn't really mind when the weather closed in and shortcut to Namche presented itself. Its a spectacular descent from here, with one long, last look at Everest showing the face we've all seen on the travel posters. There was a fair bit of emailing and phoning from Namche – just to let the folks back home know that we had all survived the expedition in good health and good cheer. Don's other daughter (not the one who got married last week) had given birth to a baby girl while we were trekking and he was well pleased to be a grandfather again. At 83 I suppose he should be getting used to it. We easily made Phakding from Namche on the way down, but it is a long haul and I think we all slept soundly at the lovely low altitude. Ian and I were both up early next morning and looking for a cup of tea in the kitchen. We surprised the life out of our porters by turning the tables on them and delivering 'bed tea'. Back to Lukla and after a visit to Bir's house it was time for a celebration. Our lodge has a bar so I was into the gin-and-tonic well before teatime. I don't remember a lot about that night. I seem to recall Bruce hitting the dance floor to Bob Marley – or was that Abba??? Our porters love to dance too and easily outdid our efforts, despite the fact that they'd been schlepping our packs around for two weeks. Sad farewells to most of the porters in the morning but a beautiful flight with clear views of the mountains. Kathmandu seems a little grotty on arrival (well, let's face it – it is a bit grotty) but the warm sunshine, the nice guesthouse and a ton of shopping to get us motivated and we were off to hit the shops – hard!! We had a fancy farewell dinner at the Vajra. When a rat appeared and started nibbling the leftovers off a nearby serving table I was mortified. What would the customers think? Soon cameras were flashing frantically, trying to get a short of ‘Basil’ in the act. Next day, Liz and Ian set off to do another trek up the Marsyangdi Valley. Most sensible people went home. Isabel went back to work at the Library she runs in the suburbs near Boda (we had a delightful visit there on the last day). Frank stayed on for a day and went up to Dorje's home with Basanta (his porter) for the last day of the festival season. He looked as though he'd eaten three Christmas dinners by the time I caught up with him in that evening. I had one day clear before my next crew started arriving and about twenty people to catch up with. Unfortunately, I ignored them all. I bought a huge bar of deluxe Swiss chocolate and lay around in my room all day – reading. Bliss! My pick-up bus was late next day and I was dreading missing my five arrivals. Fortunately, they took a while getting out and I was there to meet and greet. The four Gippslanders arrived together, Jan, Wendy (x2) and Irene, and Barbara from Sydney. Culture shock for afternoon tea then a slow walk around the bottom of Swayambunath hill, past the big new gold Buddha on the ring road. Since some of the group were falling asleep in their soup we opted for an early night. Dorje and Raj, our city guides, took the team across to Pathan while I schlepped out to the airport (getting used to it now) for our last two members. Debbie and Mary were chauffeured to the guesthouse in a nicer car than I've ever ridden in Nepal. Made a good 'first impression' anyway. We all went into Thamel for dinner but it was 'mission impossible' to keep these ladies out of the shops. Shopping in Thamel is heaven. Artwork, clothes, trekking gear, jewellery, books, maps, and lots of 'shiny new things' all at bargain prices. Who wouldn't want to shop here? We had 'Clowns Without Borders' staying with us at the guesthouse and they put on a show for the monks in the afternoon, which went down well, especially with the kids. Our last day in Kathmandu was used to buy trekking gear (rucksacks, drink bottles, walking sticks, etc). We caught up with some old friends of mine at the Weasel over a really good lunch. A 'Peace Parade' slowed the pace of the afternoon down to a crawl but the mood of celebration was infectious. We did the 'Durbar Square' thing complete with obligatory photos with 'sadhus'. Its Jan's birthday today so she copped a full 'happy birthday to you' on the bus. The trip down to Pokhara was fabulous (as ever). You have to do this trip to see how good it is. Following a green snaking river, with rapids, through narrow gorges - sometimes it is best not to look over the edge. Our porters were all there to meet the bus. Hari, Chandra, Gyannu, Tham, Khaji, Lahar. We had two new boys, Buddha and Subash and Mangal would travel up the next day. Purna and Bijay were off taking Liz and Ian Dobson (from the Everest Trek) up the Marsyangdi Valley. Some of you might remember Liz and Ian from a couple of years ago. Day two in Pokhara is a busy day for me but the customers split into two groups. One group tackled Sarankot and the 'jungle-bash' back to the lake. The more 'sedate' ladies chose to be paddled across the lake and a steepish walk up to the Peace Stupa. The view from both is mind-blowing. These day walks give me a clue as to how to proceed with the next few days trekking. of us who had a big hill to climb to Gorepani. They promised to do a long flat walk the next day to keep up their fitness. Never found out if they did that?? Group 1 set off next day, by bus to Nyapul and then an easy, if somewhat grubby little walk to the first tea stop at Birethanti. The Maoists were out in force with nice, new uniforms and printed receipt books. One hundred rupees per day of trekking seemed reasonable (especially since they were armed) and the customers had been primed to expect them. They were extremely polite. I found out later that Group 2 spun the Maoists a yarn about their group leader coming through later and got off scott free at the other checkpoint in Gar Khola. The Laxmi Lodge in Tikedhunga is a quaint, traditional style lodge but after our first day on trek we were prepared to sleep on anything vaguely horizontal. The devastation of the landslide at Nepane made me weep. I'd brought some donated funds from Australia and we chatted to the locals in the evening about where to best utilise the money. It turned out that the victims had been fairly well looked after by quite large donations from Gurkha Regiments in the UK but it soon became obvious where some folks had slipped through the net. The next day is the killer climb up to Banthanti. Nobody does this easily. We all huffed and puffed up the endless stone stairs. They say there are 3,300 of them. It felt like sixty million. Lovely sunny lunch at Ulleri, met some interesting fellow-trekkers and then a slightly less strenuous stretch to Banthanti. The climb was definitely taking its toll on Barbara but a couple of beers soon sorted her out. The walk through the rhododendron forest was absolutely beautiful. The shade made life easier and by the time we stopped for lunch it was spitting with rain. I think we had the best vegie noodle soup of the season at this place. Gorepani was still a few hours off for some so we just dawdled along and fortified ourselves with a hot chocolate at the bottom of the village. It was just enough to get us to the top. As it was fairly cloudy our arrival was not that exciting but as the sun set, the clouds cleared and the Daulaghiri range showed its splendorous ridge of peaks. By the time the moon rose Anapurna South was clear and looked pretty specky in the moonlight. I know I wasn't the only one to mop the windows during the night for another look at the peaks with the full moon shining on them. We were starting to find our trekking legs; even had energy to hit the dance floor tonight, so Jan, Debbie, Kamala did the dawn raid on Pun Hill. They were not disappointed. It’s a fairly easy, downhill day to Sikha but it was raining steadily by the time we got there. Hot showers and a warm stove revived our spirits and later, when the clouds cleared, we could hear the local girls singing in the moonlight till well after midnight. High, sweet and clear as a bell floating in through the windows as I drifted off to sleep. A high point for me. Its downhill again now and everyone's ankles and knees are letting them know it. The group 2 ladies are happily settled in Tatopani and a gang of their porters have come back up to Gar Khola (and beyond) to meet us. Even daypacks are gladly handed over amid hugs and loud 'namaste!'. The lodge at Tatopani is always really welcoming. Bougainvillea over the gate, super food, nice big rooms, oranges growing outside the windows, fab view of Nilgiri South. All this and a cold beer. Heaven. Its only 1100 metres down here. Warm and sunny for a reunion with Wendy, Irene and Mary. And good to find out that they’d had a good time too. The Group 2 ladies, plus Barbara, set off next day to split the long haul up to Ghasa into two days. Sorry to part again so soon but its only for one night. And it is quite a long way to Ghasa. The rest of us thoroughly enjoyed our day off in Tatopani. Whisky and coke is not that bad, and we had music from Khaji and Jan on the guitar that night. The climb next day to Pahiro Tapolo was quite manageable but the big new bridge across to Ghasa nearly did Debbie's head in. It is VERY BIG. It took all her concentration to get across without panicking and I think they were tears of joy at having done it that I saw on the other side. 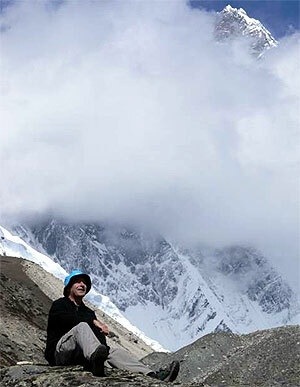 Dorje's steadying touch and words of encouragement are an inspiration to anyone who treks with him. We met some nice Germans today, one of whom was sick, unfortunately. Didn't realise then what good friends we would become later. Ghasa to Kalopani is one of the loveliest days on trek. Mountains in front of you (Daulaghiri and Tukche Peak), mountains behind you (Anapurnas mostly) and cool breezes through the pine forest. Staggering views down to the river. Sweeties lodge at Kalopani is always a treat. Good cooking, bigger beds. Sunrise on Tukche Peak, right behind the lodge, was a beauty. Staggered down, bleary eyed, to the Kalopani Guesthouse for a hot chocolate on their roof as the view from there is even better. I've stayed there once or twice but Sweetie gets REALLY cross with me. This morning we came out into the Kali Gandaki valley. It’s another world up here. The road is good for the tractor- bus and the odd motorbike. Some find that a little bit distracting but at least the trail is good for us too now. There are plans afoot, through the Anapurna Conservation Area Park Committee to upgrade the trail on the other side of the river, with temporary bridges to cross back to the main villages. This may be a better alternative in seasons to come. Some of the more interesting sights are off the main trail and it’s a good idea to separate the trekkers from the motorised transport. Mind you, at times the tired legs were very glad to do the last couple of hours by motorbike. I think I lost four walkers to local taxi-bike that afternoon. Tukche really turned it on for us. We had heard there was to be Lama Dancing at the Tukche Gompa that afternoon. Had no idea it would be so good. The place was packed to the rafters, quite literally, with folks from miles around. Locals and foreigners alike enjoyed the dancing, in beautiful old costumes. The Gompa had been given a fresh whitewash and straw was strewn about to sit on. The local dignitaries were all there. Trekkers with thousands of dollars worth of digital equipment vied with small kids, hands sticky from too many sweets, for a view at the front. The trek up to Jomsom is lovely easy, open trekking. Warm in the sunshine too. We took a long, lazy lunch at Marpha. Time to explore the village a little. Someone brought a large group of black yaks into the stables at the edge of the village, which caused a bit of a stir when they all got a bit ornery. Running back to tell Kamala to get out her camera, with half a dozen jogging yaks on my tail it felt like Pamplona there for a moment. 'Funny tummy' kept a couple of trekkers at home in the morning while we set off for Kagbeni. Unfortunately, having decided to catch us up by pony in the afternoon, all did not go smoothly. Irene was chucked off her horse, and limped into Kagbeni looking much the worse for wear. It turned out to be just bruising – quite bad bruising – but you had to hand it to her for grace under duress. Our last day is on horseback so clearly a couple of people were not going to join us. 'Enough horseback riding for one lifetime' was the comment I heard. They had a great low-key day mooching around the medieval ruins of Kagbeni. Nice choice! The rest of us were up early and plodding steadily uphill by 7.30. I had 'Spotty' a kind of 'Dalmatian pony'. I've had him before. Likes the front but kind of steady with it. There were a few mutterings amongst the ranks as the less-experienced riders looked over the edge of the trail. The ponies are extremely sure-footed and even first-timer Debbie soon got to like it. It’s a hell of a schlep up to Muktinath on foot. The temple and the gompa at Muktinath were the usual treat. Something magical happens to you in the little Buddhist gompa where the flame and the water come out of the rock. Its nothing special to look at and yet..... Perhaps its the shadow of all the past visitors wishing you well, but you always come out of there feeling 'touched' somehow. After a huge daal bhat lunch we strode home full of good feelings. We'd made it after all. Barbara struggled a bit and I was pleased to see her torch coming down the hill just outside the village at quarter to six when I went out looking for her. She was in good hands with Chandra. That night in the kitchen of the Asia Lodge at Kagbeni was a hoot. Takahashi San and his friends will not be easily forgotten. Russians, Portugooses and all our/their porters and guides set the place alight with singing and dancing. Good times! We didn’t bust a gut to get the early start we should have from Kagbeni. Debbie and Kamala wanted to see the five-hundred-year-old gompa. 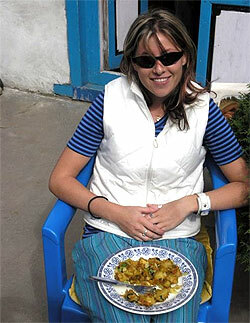 We struck it lucky with a low-wind day and cruised into Jomsom by lunchtime. In the afternoon I took Debbie and Kamala on a hair-raising motorbike ride up to Shyang village. Previous customers are supporting a local girl to go to boarding school. It took me over an hour and every argument I could think of to persuade her mother to let her go. A s we were booked on third flight back to Pokhara (always a risk in this windy area) I had my doubts about getting out on the scheduled day. Luckily, the weather stayed fair and we had a wonderful flight down. Light snow had freshened up the peaks for us the night before. Daulaghiri was magnificent, as were the Anapurnas on the left side. Pokhara seemed soft and warm. Showers, clean clothes, big breakfast, shopping, massages, rest. Delightful. Our bus trip home was a nice rest too, and Takahashi San's group were on our bus. The BPD Guesthouse was a familiar haven. Thamel was not safe with people like Mary on the warpath for a bargain. We shopped, and shopped and shopped. Being an all girl group we had formed a tight-knit bunch through our travels. It was heartbreaking to say goodbye to these gals at the airport. I stayed on for a few weeks this season. What a treat that turned out to be. It’s been years since I've spent any 'quality-time' at Pokhara hanging out with friends. The pace of this town is so easy, especially out at Lakeside. The rice harvest was coming to a close, folks had time to sit around and chat, sometimes by the fire outside in the evenings. Plenty of good music on at the Busy Bee. I could live there! I'll be going back on February 15 for the Anapurna Trek (22 days away) if anyone feels like joining me. The next group should arrive March 12 for Everest (18 days) if that's more your cup of tea. So, get on the phone to 03 9315 9617 or email me at teresadidi@slowtrekking.com or maybe just have a look at the website at www.slowtrekking.com. The prices for next season are $1950 for either trek. Air tickets are holding at about $1650 (ex Australia) As usual, I'll cover you for almost everything you need. Spending money depends entirely on your propensity for shopping. You should be warned though – the shopping here is REALLY GOOD!! Look forward to hearing from some of you soon.